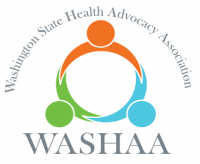 The Bellevue Network on Aging has invited WASHAA to give a presentation on the Emerging Field of Health Advocacy that is free and open to the public. During this 40 minute presentation, Robin Shapiro will discuss why health advocacy skills are needed and how patients are using skills and information to get better care. There will also be a limited number of materials (including a reprint of our Annual Meeting Resource Guide on Conscious Living & Dying: Health Advocacy at End of Life) that will be handed out for free. This meeting is free and open to the public.